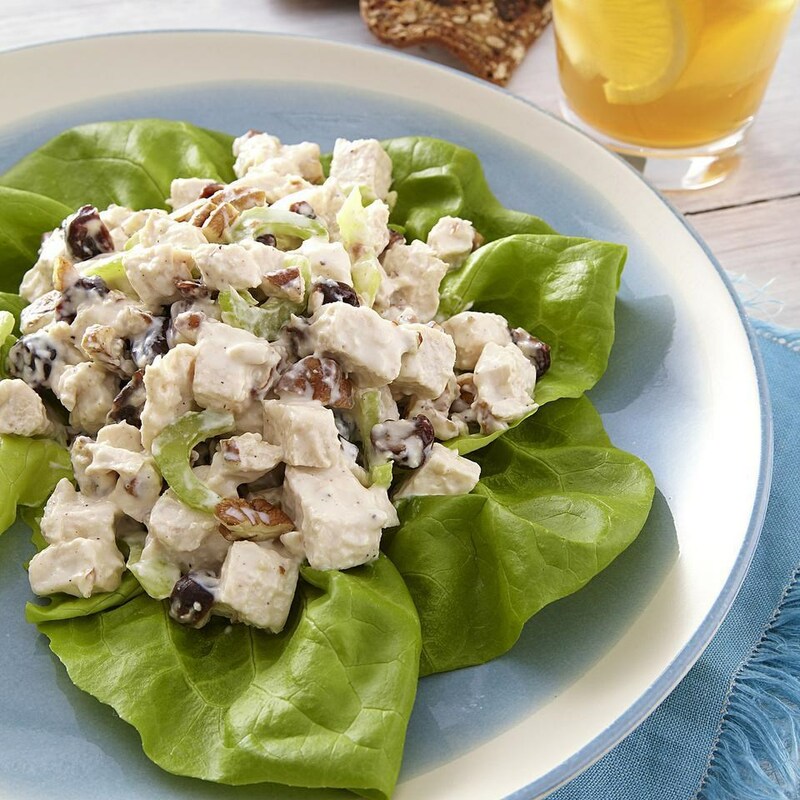 This healthy chicken salad recipe is sweet and crunchy thanks to the addition of heart-healthy pecans and fiber-rich dried cherries. 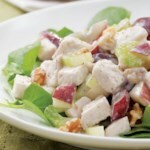 If you have cooked chicken breast on hand, skip Step 1 and use about 3 cups chopped chicken in Step 3. 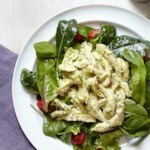 Place chicken in a medium skillet or saucepan, cover with water and add ¼ teaspoon salt. Bring to a boil. Cover, reduce heat to maintain a gentle simmer and cook until the chicken is no longer pink in the middle, 10 to 15 minutes. Transfer to a plate to cool. 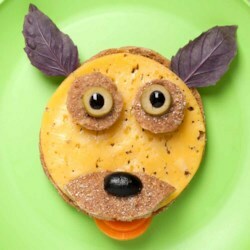 Meanwhile, combine yogurt, mayonnaise, mustard, pepper and the remaining ¼ teaspoon salt in a bowl. When the chicken is cool enough to handle, cut into bite-size pieces. 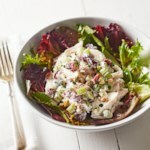 Add the chicken, celery, pecans and cherries to the bowl with the dressing and toss to combine. 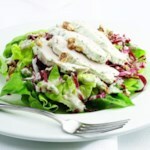 Divide lettuce leaves among 4 plates and top with about 1 cup chicken salad each. 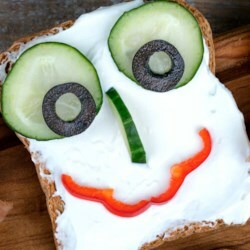 Make Ahead Tip: Prepare through Step 3. Add pecans and cherries just before serving; refrigerate for up to 1 day. Easy and crunchy, but rather bland This is an easy salad that is good for lunch on a hot day. I followed the recipe as written but found it quite bland. I added additional mustard and black pepper to the dressing to spike the flavor.